The Fleet Enema is a saline laxative that comes pre-packaged, pre-lubricated, and ready to use. It is latex free and each bottle is 4.5 oz. Use for relief of occasional constipation or bowel cleansing before rectal examinations. Disposable and very easy to use this product generally produces a bowel movement in 1 to 5 minutes. Warning: Using more then one enema in 24 hours can be harmful. Constipation generally occurs if you have three or fewer bowel movements each week, and your stools are hard, dry, and difficult to pass. In this situation, Fleet Enema can provide help and relief. Fleet Enema is a saline laxative. Saline laxatives work by drawing water into the colon which helps produce a bowel movement. This provides a soft stool mass and increased bowel action. A bowel movement should be stimulated in 1 to 5 minutes, without pain or spasm. 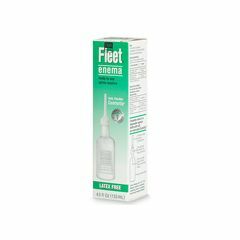 Fleet Enema is also ideal for bowel cleansing before undergoing a rectal examination. Plus, it's latex-free. Fleet Enema comes in a ready-to-use, disposable squeeze bottle with a soft, pre-lubricated Comfortip®. When I get constipated and need fast relief, I use Fleet and within 5 minutes I have a bowel movement, this product is easy to use with very little discomfort when injecting the fluid. Your stomach might cramp up like it does when you have diarrhea but its not that bad and means that its working. The directions for use is very user friendly and clear to understand. I have never had any problems with this product and recommend it for everyone to use!